Résidence Hôtelière Laudine price per day from € 64 . 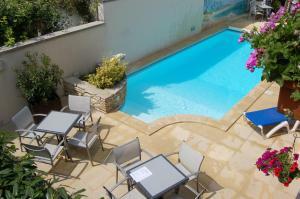 Le Pavillon de Nathalie price per day from € 90 Set on a 3500 m² garden, Le Pavillon de Nathalie is in the centre of Isles-sur-Suippe and 1 km from the A34 motorway. The private bathroom is complete with free toiletries, a hairdryer and a shower. The suite includes a kitchenette with a microwave, a fridge and a minibar.. Au Milieu de Nulle Part price per day from € 84 Set in a planted garden, this guest accommodation is just 1 5 km from Der-Chantecoq Lake and 2 It offers guest rooms surrounded by nature and woods. All the rooms at Au Milieu de Nulle Part include a bathroom and free Wi-Fi and they offer a garden view. Many activities are available at Au Milieu de Nulle Part, such as fishing, bird watching and hiking with the donkeys..
La Source Bleue price per day from € 140 Set in a 17th-century water mill, this hotel is located in a 5-hectare park surrounded by centuries-old oak trees. It features Art Deco guest rooms with a balcony or terrace. All of the rooms feature unique artworks and views over the garden and the lake. 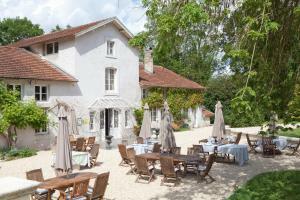 Goumet cuisine is served in the restaurant with a shaded terrace at La Source Bleue.. 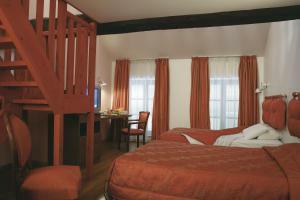 Le Champ Des Oiseaux price per day from € 349 Le Champ Des Oiseaux is located in the historic town of Troyes, a short walk from the Saint-Pierre-et-Saint-Paul Cathedral and the Modern Art Museum. The hotel also has a planted courtyard where guests can sit and relax. Le Saint Michel price per day from € 99 . Picardy price per day from € 42 . La Sapinière price per day from € 66 Located 6 km from Sedan, in a small typical village called Remilly-Aillicourt, this hotel offers a regional restaurant, a floral terrace and a bar. 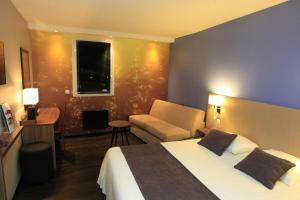 Qualys Hotel Reims Tinqueux price per day from € 64 . Logis Hôtel Au Tambour price per day from € 73 .